"There is no credible intelligence or other evidence to substantiate the claims or the possession of CW by the opposition. The JIC has therefore concluded that there are no plausible alternative scenarios to regime responsibility". That, it seems is the considered opinion of the Chairman of the Joint Intelligence Committee, a man unable to offer an explanation as to why the Assad regime might have decided to carry out last week's attack. I'm glad this man wasn't investigating the 1933 Reichstag fire, but then he would have been a bit young for the job, if otherwise ideally suited. But if that is the standard of evidence needed to go to war, then God help us all. Even Mr Cameron concededthat there was "no smoking gun" yet he still wanted to "punish" Assad. This, he said was "a judgement call". According to Autonomous Mind, the Coalition was driven by a determination to "do something", with more emotion than critical thinking from a group of politicians which is displaying a disturbing lack of intellectual maturity. "Inaction is not a choice without consequences", said Mr Clegg during this evening's debate (pictured), even if he was unable to tell us what those consequences might be. Earlier, the failure to get a consensus from Parliament was being blamed by an "angry" No 10 on Ed Miliband, although numerous sources were confirming what we were saying yesterday - that there were many Tories who were distinctly uneasy about the proposed action. In the event, after the opposition lost its amendment by 12 votes, the Government then lost its motion by 13 votes - 285 cast against, with 272 for – an unlucky thirteen. 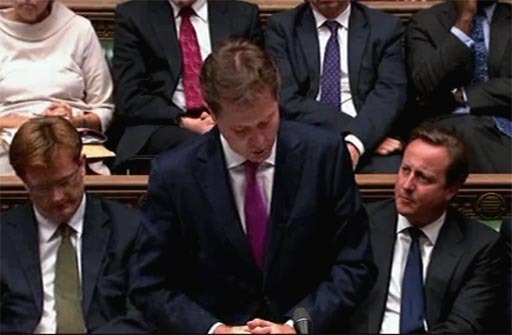 This, by any measure, is a humiliating defeat for Mr Cameron – and Nick Clegg – and it could not be more well-deserved. The lack of coherence in the arguments has been quite staggering. To have accepted the Government case would have signalled the final, catastrophic end to the credibility of Parliament. After the result had been declared, Ed Milband was up on his feet with a point of order, demanding an assurance that the Royal Prerogative would not be used. Acknowledging his defeat, Mr Cameron gave the assurance. "It is very clear tonight", he said, "that, while the House has not passed a motion, it is clear to me that the British parliament, reflecting the views of the British people, does not want to see British military action. I get that and the government will act accordingly". This is the end of any prospect of British intervention, but this is not the end of this affair. To have made this a "judgement call" and then to fail to convince the House to back that judgement itself is an appalling political mistake. Mr Cameron emerges weaker, his credibility – already at rock bottom – now shot to pieces. There may well be other consequences of this affair, though. Public responses, feeding back into the political process, have been conditioned to a very great extent by the events of Iraq, Afghanistan and Libya. An internet savvy population, not dependent on what they are told by the legacy media, have been making their own decisions, and have rejected the political arguments presented to them. Historically, we have tended to attribute more wisdom and knowledge to our leaders than they deserve. Currently, their standard of debate and grasp of the issues would disgrace the Lower Sixth. And there is a reason for this, which has nothing to do with their inherent intelligence or capabilities. Being in the bubble, as are these politicians, means that the flow of information is heavily filtered, and their conditioning prevents them from rationally interpreting that which does get to them. As a result, they are actually less well-informed than the intelligent internet user, and less capable of processing the information that they do get. Come other debates, such as during the EU referendum campaign that must eventually happen, the politicians and (often self-appointed) "opinion formers" are going to have to get used to the fact that there is huge constituency better informed than they are. This changes the nature of the debate, its dynamics and tempo. People are no longer passive receptacles of information. They need to be engaged in the debate, and politicians who ignore that, or fail to cope with it, will suffer - as indeed did Mr Cameron on the day.